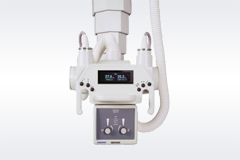 The Control-X Halo Overhead Tube Support is a heavy-duty, manually operated, fully counterbalanced ceiling mounted unit that provides great flexibility in order to faciliate a wide variety of x-ray procedures. This sytem may be combined with various generators, DR Panels, Tbales, and Wall Stands to make a complete hospital-grade Radiographic X-Ray Suite. Call for a complete quotation.